Space: the final frontier. The dedicated development team at Rob Papen are always on a continuing mission to explore creative new worlds… and boldly go where no one has gone before. But space is quite literally the final frontier, with RP-VERB 2 deftly delivering some truly thrilling tools to explore within its resonating realms, not least its individualistic REVERB spaces, including Room Storm — superb on drums and percussion! Put it this way: with RP-VERB 2 it is easy to (re)create the famous Phil Collins drum sound from his hit single ‘In The Air Tonight’ — and all without resorting to the technical talents of engineer/producer Hugh Padgham, a modified SSL large-format console… and, of course, Phil Collins himself! However, many more enhancements are available in RP-VERB 2. As implied by name, pre-reverb DISTORTION adds additional bite to the room sound, for example — excellent for drums and percussion, too, but equally at home on vocals for creating a more edgy sound before the reverb itself is applied. Alongside its superb sound, of course, maybe most intriguing is RP-VERB 2’s recently-added REVERSE section. 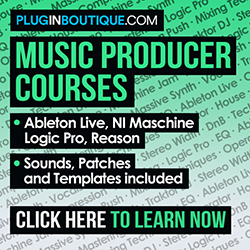 In playing back the reverberated sound in a most creative way, while doing so it SYNCs to the tempo of the host DAW (Digital Audio Workstation) and is easy to control. REVERSE is an awesome tool for creating some uniquely fresh sounds — works well on any sound source, from vocals to drums and loops… you name it! 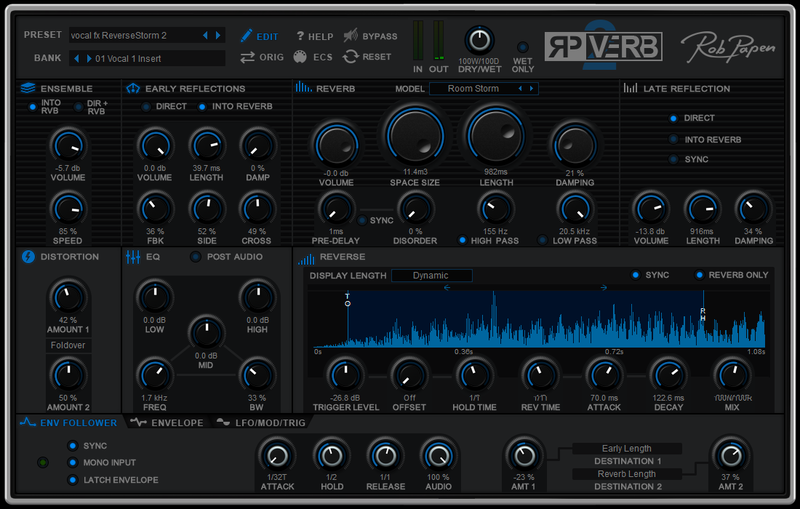 Various Rob Papen-programmed presets are included in RP-VERB 2 to showcase REVERSE in action. Additionally, there is an ENV (envelope) FOLLOWER on board RP-VERB 2 to effortlessly enable gated reverbs ringing out (‘In The Air Tonight’). This can also be used to control other RP-VERB 2 parameters at the same time. That said, more modulation options are available, including an additional ENVELOPE, LFO (Low Frequency Oscillator), and a modulation matrix. Many more RP-VERB 2 parameters are available to enable deep space exploration. Enjoying the creative spaces within RP-VERB 2 is audibly a continuing musical mission in itself, so why not boldly go where no reverb effect plug-in has gone before? Space is the final frontier, after all!